This year's Stars on Ice presented by Musselman's tour will ensure skating fans don't suffer from the post-Olympics blues. Featuring some of the top American skaters from the 2018 and 2014 Olympic games, the 2019 Stars on Ice presented by Musselman's tour will offer a true red, white and blue celebration on ice. The Tour will arrive in Saint Paul on Friday, May 3 for a 7:30 p.m. performance at Xcel Energy Center. This year's Stars on Ice presented by Musselman's tour will put the best of American figure skating past, present and future front and center for fans to experience. Highlighting this year's tour will be Olympic Gold, Silver and Bronze Medalists, two-time World Champions and six-time National Champions Meryl Davis & Charlie White; two-time Olympic Bronze Medalists, two-time National Champions and three-time World Medalists Maia & Alex Shibutani; three-time National Champion and 2016 World Silver Medalist Ashley Wagner; 2018 National Champions and World Silver Medalists Madison Hubbell & Zachary Donohue; and National Champion and huge crowd favorite, Jason Brown. Please visit starsonice.com regularly for cast and show updates. Stars on Ice continues to be a pioneer in figure skating by offering fans the rare opportunity to witness some of the world's most creative and cherished champions performing together in both individual and ensemble routines. 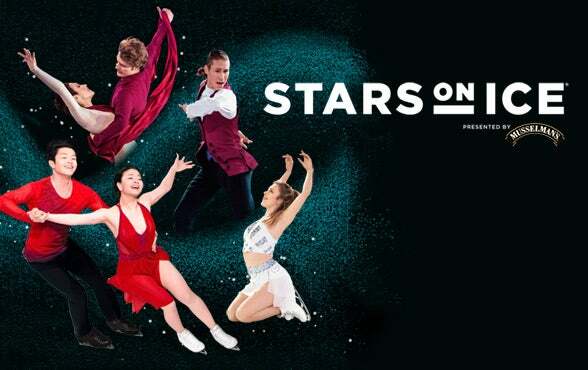 Founded and produced by Olympic Gold Medalist Scott Hamilton, Stars on Ice is one of the premier family entertainment events in the U.S., and the only figure skating tour in America, that has annually brought fans the greatest American figure skaters into their hometowns. Founded in 1986 by skating icon Scott Hamilton, the Stars on Ice tour has performed more than 1,500 shows over the last three decades. Past tour performers include Olympic Gold Medalists Kristi Yamaguchi, Katarina Witt, Scott Hamilton and Torvill & Dean. The Tour has won three Emmy Awards, one ACE Cable Award (Best Sports Special) and is recognized as the finest ice production in the world. Stars on Ice is produced by IMG, the global leader in sports, fashion and media. For more information about the Tour, visit starsonice.com. Keep in touch with Stars on Ice on Facebook, Instagram and on Twitter.